New Bicycle and Pedestrian Facilities Installed on Parkside Ave.
As part of the city’s Vision Zero plan, a new 2-way bike lane—which is partially protected—was installed recently on Parkside Avenue in West Philadelphia, creating a more organized street, safer for bicycling and walking in that section of the city. 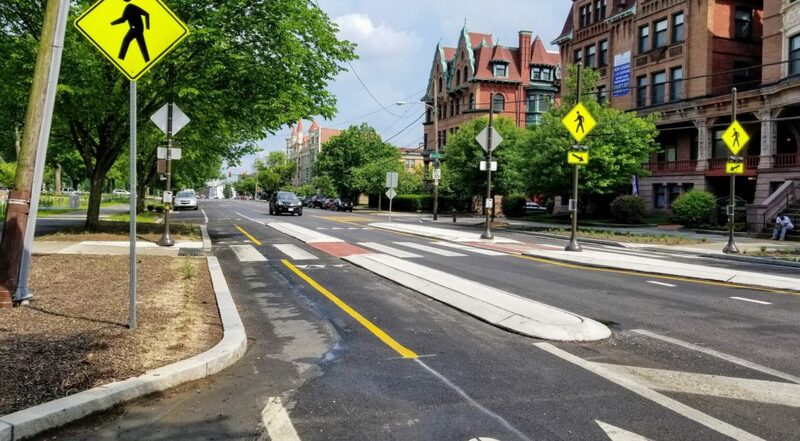 The project, which runs from 52nd Street to Girard Avenue, not only creates new, better bicycle infrastructure, but shortens crossing distances for pedestrians, creates pedestrian refuges, and better connects neighbors to Fairmount Park and the newly-opened Centennial Commons in West Fairmount Park, which opened on Wednesday, June 13. As we noted last year of Parkside Avenue, there were 147 reported crashes on the corridor between 2012 and 2016, which injured 120 people. As noted by PlanPhilly, Councilman Curtis Jones, Jr., OTIS, and neighborhood stakeholders were instrumental in getting the bike lanes created and installed. Additionally bike lanes are being put in Fairmount Park on parts of Lansdowne Drive and South Concourse Drive. The end goal of this particular corridor is to have fully-protected bike lanes. Unfortunately, since this is a PennDOT project, the lanes alongside parking were installed as standard bike lanes, between moving traffic and parked cars, rather than between parked cars and the sidewalk. In order for the parking and bike lanes to be flipped, the state Legislature needs to pass Senate Bill 788, which was introduced by State Sen. Larry Farnese (D-Phila). The bill would allow for parking-protected bike lanes on PennDOT roads installed by PennDOT crews. Currently, parking-protected bike lanes are OK on state roads, like Chestnut Street, but PennDOT crews will not install them. Weird, right? We’ve been traveling to Harrisburg to advocate for this, and many other, bills throughout the Spring. Either way, this project is a big step for Parkside Avenue, and for making this particular more bikeable—especially considering the tremendous work Indego Bike Share has been doing in the area. If the bill become law how long until the road is restriped? Are these more cross walk improvements coming? What about those slip lanes at Parkside and Belmont?